Chris Impey is a professor of astronomy at University of Arizona, and has done a fine job with this latest effort at bringing astrobiology to the popular science market. Impey has clearly done his research thoroughly, and interviewed a great number of the key scientists whilst writing the book. 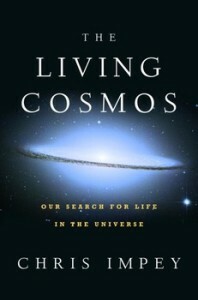 The Living Cosmos opens with a solid review of the history of astronomy and philosophical thought on the nature of the universe and our world’s place within it. This is not often covered in astrobiology popular science books, and provides crucial context to the significance of modern astrobiology research and the possible impact a discovery of extraterrestrial life may have. Overall, the extensive material is well organised into a logical sequence of chapters, with the narrative marching confidently through the origins of life, extremophiles, evolution and cosmic influences on Earth, potential extraterrestrial habitats in the solar system, and then exoplanets. The final chapter contains a balanced discussion on the possibility of alien civilisations and SETI, and what implications their existence may pose for the future of humanity and religion. Even potentially-difficult topics are patiently and clearly discussed, and Impey employs many of the familiar metaphors and explanatory tools. The entire 13.7 billion year history of the Universe is described compressed into a single calendar year, with the Sun and Earth forming in early September, our planet becoming smeared with microbial life within a fortnight, and the whole of human history lasting a bare few seconds to midnight. There are inevitable errors in the text, but these are sparse and on the whole I found the book robustly researched and written. The Living Cosmos is not only comprehensive in its treatment of the great breath of astrobiology research, but is also beautifully written. Each chapter opens with an engaging account, full of imagery, of the up-coming topic. Impey also has a wonderful turn of phrase: extremophiles are introduced as tiny superheroes, each with special powers to enable survival in the harshest environments, and attempting to detect extrasolar planets by microlensing is described as being like standing in a football stadium trying to catch the one person about to pull a moonie at you. On the whole, The Living Cosmos is a sterling attempt at making astrobiology accessible to a general audience and I enjoyed reading it immensely.